The European Union's smallest state has been in a customs union with Belgium for many years and shared a common currency since the 1920s. Despite this, it has levied a much lower duty on motor fuel than any of its neighbours, which has led to a dense service station network. In particular, each major brand has tended to own a service station in villages adjacent to main border crossings, creating a gasoline alley effect not seen elsewhere in Europe. Its downstream petrol industry has always been closely allied to that of neighbouring Belgium. In the 1960s the only difference was the presence of the German (ex-Saar) company Frisia, but when that was sold to Gulf there were no Luxembourg operators not also found in Belgium. Occasionally there have been small Luxembourg independents such as Alca in the 70s and Luxoil today. In recent years some German names have also crossed the border including DEA and the tiny independent Wolters as their stations in the Mosel valley have lost sales to their cheaper neighbours in the Grand Duchy. In 1998 when BP sold its Belgian operation it retained a presence in Luxembourg, as BP's busiest single station in Europe is a motorway service area in Luxembourg. A late 50s or early 60s map "Offerte gracieusement par Esso Luxembourg S.A.", but produced for them by the national tourist office. The map measures 45 x 36cm. 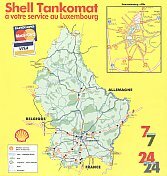 Few maps of Luxembourg on its own are known from the main period when oil companies sold maps in Europe. Most main Belgian firms issued a combined Belgium/Luxembourg map which was also used for their Grand Duchy operations. 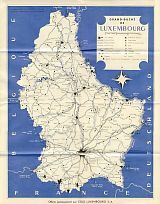 However in the late 1950s Shell issued a city plan of Luxembourg in its Belgian city series - as its clearly says "BELGIUM" on the cover, it seems unlikely that this map could ever have been distributed in the Grand Duchy itself! The Chevron map is a local production, unattributed and undated, but bought in neighbouring Germany in 1972. It is single side and soft-covered and marks all Chevron stations. The rear carries the widely used F-310 advertisement. Given that there was this Chevron production, it is likely that Caltex also sold a map of Luxembourg. The Total map - drawn to a scale of 1:150,000 - also dates from 1972. The side shown is in French but the reverse is in German, the country's other official language, saying "Strassenkarte Luxemburg". 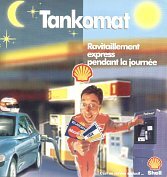 The French language Shell leaflet shown centre and right is much more recent, dating from 1998 and was printed by Inter Communication to promote their automated "Tankomat" stations. The cover opens down the middle to reveal the same basic picture, but is die cut around the pecten. The rear of the leaflet has surprisingly detailed map of Luxembourg, identifying wooded areas as well as Tankomat locations. Thanks to Michel Breugelmans for the Esso and older Shell, to Jon Roma for the Total and to Richard Horwitz for the Chevron map images.